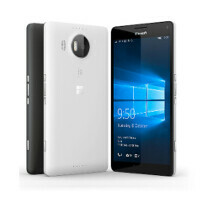 If you've ordered the Microsoft Lumia 950 or the Microsoft Lumia 950 XL from the Canadian Microsoft Store for Christmas, the good news is that the handsets will arrive in time for the holiday. The bad news is that the margin is the thinnest possible. According to Microsoft Store website, the two Windows 10 Mobile powered phones will arrive on Christmas Eve. Perhaps as a way to apologize for cutting things close in Canada, Microsoft is offering some deals on accessories for the handsets. For example, you can save as much as $60 by purchasing a bundle that includes a portable charger, a screen protector and a phone case, for only $84.99. Another package being offered by Microsoft is called the Display Dock Productivity bundle. Priced at $119.89, you get a Belkin Ultra-Thin High Passive 6-foot HDMI cable, an Arc Touch Bluetooth mouse and Universal Mobile keyboard. The Display Dock itself isn't part of the bundle. But if you order the Lumia 950 XL from the Microsoft Store, you are eligible for a free Display Dock via the Lumia Offers app. The Display Dock is used in conjunction with the Continuum feature that turns the Lumia 950 and the Lumia 950 XL into a desktop PC. The Dock allows you to connect either phone to a monitor, a mouse and a QWERTY keyboard. Lo and behold, those are the devices you get when purchasing the Display Dock Bundle, along with the required cable. Looks like there will be 17 happy Canadians come Christmas! And still no mention of when they'll ship the unlocked in the US.